These soft and delicious bite-size buns are perfect for sliders and small burgers. They also make fantastic appetizer sandwiches, whether it's for lunch, dinner, or a party. Everyone will love your homemade buns filled with tiny burgers, seafood salad, shredded beef, pulled pork or chicken, or other delicious sandwich fillings. The mini buns can be prepared by hand, with your stand mixer, or in a bread machine. The recipe makes about 24 to 26 ounces of dough that can be divided to suit your needs. When you divide the dough into 18 pieces weighing 1 1/2 ounce each, they're perfect for 2-ounce burgers or meatloaf sliders. 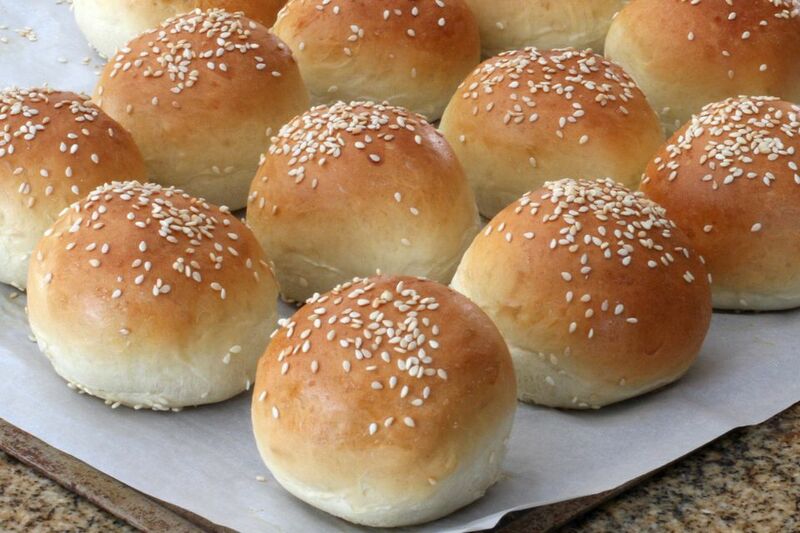 For smaller appetizer sandwiches and burgers, make 24 rolls using 1 ounce of dough for each. For a shinier and firmer top crust, brush the buns with an egg wash just before baking. You can also sprinkle the buns with sesame seeds for a fun finishing touch. Combine the yeast and warm water in a large bowl or the bowl of a stand mixer. Let the mixture stand for about 10 minutes, until foamy. Whisk the milk, egg, and melted butter together to blend. Add the milk mixture to the yeast mixture along with the sugar, salt, and flour. Knead the dough by hand or using a stand mixer with the dough hook for 8 to 10 minutes, adding a little more flour if necessary to keep the dough from sticking to your hands, the countertop, or the sides of the bowl. The dough should be smooth and elastic at this point. Generously grease a large bowl with butter or oil. Gather the dough into a ball and place it into the greased bowl. Turn over a few times to coat the dough thoroughly. Cover the bowl with plastic wrap and let the dough rise for 1 to 1 1/2 hours, or until it has doubled in bulk. Punch down and pat the dough into a rectangle. Cut into 18 pieces, about 1 1/2 to 1 3/4 ounces each (or smaller). Shape the dough pieces into firm balls, flatten slightly with your hand, and place on the prepared baking sheet about 2 to 3 inches apart. Cover the buns with a lightweight kitchen towel and let them rise in a draft-free place for about 30 minutes. For the egg wash, whisk the egg white with 1 tablespoon of water until blended. Just before the buns are ready to go into the oven, brush each with the egg wash mixture and sprinkle with sesame seeds or poppy seeds. If you prefer to skip this step, brush the tops with a little melted butter after baking while they're still hot. Let the buns cool on a rack and split the buns apart. If you have a bread machine, it can take some of the work out of making these mini buns. You will have to shape them by hand, but at least the dough will be mixed perfectly. In a small bowl whisk together the milk, melted butter, and egg. Place the milk mixture, flour, sugar, salt, and yeast in the bread machine in the order suggested by the manufacturer. Remove the finished dough to a lightly floured surface. Shape and bake the buns as above. There's an easy way to cut the buns without a kitchen scale. For perfectly even shapes, use a biscuit cutter, which comes in multiple sizes and either round or square shapes. You can also use your pastry cutter and measure the dough cuts to the desired size. Once you have the dough made, roll half of the it until it's approximately 1/4-inch thick or slightly more. Cut the dough out with a 1 1/2-inch cutter. A 2-inch cutter works great for the larger slider buns. Repeat with the remaining dough and place the buns on the prepared baking sheet and continue with the rising and baking steps above.